We’d love your help. 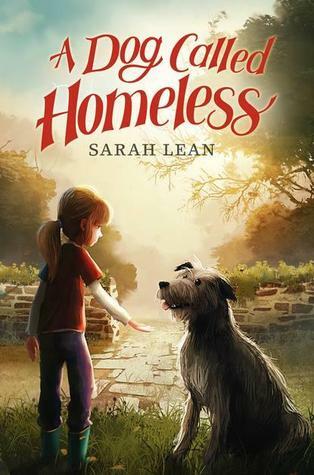 Let us know what’s wrong with this preview of A Dog Called Homeless by Sarah Lean. Cally Fisher knows she can see her dead mother, but the only other living soul who does is a mysterious wolfhound who always seems to be there when her mom appea Praised by Newbery Medal–winning author Katherine Applegate as "graceful" and "miraculous," this Schneider Family Book Award–winning novel tells how one girl's friendship with a homeless dog mends a family's heart. To ask other readers questions about A Dog Called Homeless, please sign up. Even though I don't normally go for "Heartwarming/Feel Good" literature, I'll agree with the majority of reviewers on this one. This book really tugs at your heartstrings, in the best possible way. Have you ever lost someone close and have not been able to recover from their death? Do you love dogs? Are you looking for a warm, feel-good and beautiful little book to read? Then 'A Dog Called Homeless' by Sarah Lean is for you. I had been struggling of late with a reader’s block, especially with fiction books. But this book, thankfully, found me at the right time. This is a beautiful and quiet little story about a girl named Cally Louise Fisher who is trying to deal with the death of her mother and how it has torn her family apart. At the first death anniversary of her mother, Cally sees her mum bright and real and alive. But no one believes her. Then she finds a mysterious wolfhound that always seems to be there when her mother appears and is always keen on following Cally, even when she has been made to shift her house. Meanwhile, Cally’s father never mentions her mother, almost as if adamantly denying her existence. Cally tries to redeem him desperately. But fails. The profound changes in her life are affecting Cally deeply and then one day she simply decides to stop speaking. Because she becomes convinced that what she says doesn't matter. Her only friends are Mrs. Cooper, a neighbor in their new apartment building, and her blind and nearly deaf 11-year-old son, Sam. In their company, Cally finds some solace. And then there’s the mysterious dog that keeps finding Cally – in her school, on her little trips, in her home. Cally is pulled towards that dog and finds comfort in his warm and friendly presence. But his father wouldn’t let her anywhere near him and her school teachers think there’s something seriously wrong with her. Cally's world is changing and it getting too much for her to handle. Giving away more plot details would be revealing some crucial details of the story. But Cally’s journey of self-discovery and how she finds her voice – both literally and figuratively – forms the rest of the book. The ending and the resolution is so satisfying and moving that I wished I could read it all over again. This is a very tender and sensitive story. Although the book is targeted at younger audiences, I won’t recommend this for children as I don’t think they would be able to grasp the sensitivity of the theme. It is heartbreaking to see and feel what little Cally is going through from inside. The book is narrated in first person and delicately captures Cally's suffering and turmoil as her family and friends refuse to understand her pain. And having lost a mother at a young age and seen how it tore at my family, I could relate to a lot of the events in the book. Especially the changes my father went through after her death. To accept the death of a close one and move on is not easy. And the issue has been very deftly dealt with in this touching book. Another part I absolutely adored in the book was the friendship between Cally and Sam, the blind and nearly deaf boy. Their bonding is so pure and beautiful my heart was swimming in warmth. I wish there is a book dedicated solely for Cally and Sam's friendship. It was so unique and heartwarming and something I had not read before. And the book left me thinking even hours after I had read the last word. I remembered my mother. And how I had gone into this shell for months after her passing. And I remembered how difficult the healing process was. And is... The book touched a a very sensitive chord. But in a heartbreakingly beautiful way. I’m not sure how I missed this quiet story about sweet Cally who is trying to deal with the death of her mother, but I’m so glad I finally picked it up. Cally stops speaking as a part of a class fundraiser but quickly realizes that maybe not talking is exactly what she needs to do for awhile. This story will be one I re-read many times just for the pure enjoyment of reading. A beautiful story of family, loss, and belonging that shouldn't be missed. Most definitely deserving of the 2013 Schneider I’m not sure how I missed this quiet story about sweet Cally who is trying to deal with the death of her mother, but I’m so glad I finally picked it up. Cally stops speaking as a part of a class fundraiser but quickly realizes that maybe not talking is exactly what she needs to do for awhile. This story will be one I re-read many times just for the pure enjoyment of reading. A beautiful story of family, loss, and belonging that shouldn't be missed. Most definitely deserving of the 2013 Schneider Family Book Award. Well done Schneider Committee! A beautiful book about grief and how the loss of a loved one can tear a family apart. This book is a wonderful read not just for kids. Highly recommend. What a heartprint book. I knew by page 6 I wanted to jump in and help Cally. Or put my arms around her and hug her. Sarah Lean did a great job crafting the characters of Cally and Sam. What a gem. First Read: Cally Fisher saw her mum bright and real and alive. But no one believes her, so Cally's stopped talking. She hasn't been talking. She has not spoken for thirty-one days. A mysterious wolfhound always seems to be there when her mum appears and now he's started following her everywhere. But how can Cally convince anyone that Mum is still with them, or persuade Dad that the huge silver grey dog is their last link with her. This is a very tender book. Her mother died about a year earlier First Read: Cally Fisher saw her mum bright and real and alive. But no one believes her, so Cally's stopped talking. She hasn't been talking. She has not spoken for thirty-one days. A mysterious wolfhound always seems to be there when her mum appears and now he's started following her everywhere. But how can Cally convince anyone that Mum is still with them, or persuade Dad that the huge silver grey dog is their last link with her. This is a very tender book. Her mother died about a year earlier due to illness. Their daughter Cally has major depression issues, but there are ways she is slowly able to work through it. Why did I decide to read this book? I've heard very good things about the book and decided to read it. Why did I like it? I liked the book because it was so heart-warming and a little sad and had quite a bit of suspense which really engrossed me and kept it glued in my hands. A thing I learned: You can communicate with people by tapping their hand, like with a deaf person. A character that interested me: Jed-Jed (The homeless man) interested me because he was given Homeless (the puppy) and told to look for the mother's family, right before she died. He persisted, although he didn't have a home, and eventually found them and went out of his way to get Homeless to his rightful owners. Recommend. Second Read: In this British import, a girl grieving for her dead mother gives up talking when she becomes convinced that what she says doesn't matter. Cally's father never mentions her mom, which seems to deny her existence. Then Cally begins to see her mother—a ghost or wishful imagining?—dressed in a red raincoat and sometimes accompanied by a very large dog that's assuredly not a ghost since he turns up independently at school, in the park and especially with a homeless man, Jed. Cally also meets Mrs. Cooper, a neighbor in their new apartment building who lovingly cares for her blind, nearly deaf 11-year-old son, Sam. Mrs. Cooper, Sam and a psychiatrist all reach out to Cally, each offering wise support, but it's Cally herself, perhaps with the quiet help of her mom, who finds a believable—if a bit miraculous—and highly satisfying resolution. Fifth-grader Cally's first-person voice effectively captures both her suffering and her bewilderment as friends and her father all fail to understand her pain. When she tells Sam she sometimes thinks her mother became a star after she died, he astutely asks, "Why would she go so far away?" giving Cally a comforting new way to think of her mother, much closer to her heart. I decided to read 'A Dog Called Homeless' because I read about 2 chapters in the past and never finished it. I have also heard very good things about the book and decided to read it. I liked the book because it was so heart-warming and a little sad and had quite a bit of suspense which really engrossed me and kept it glued to my hands. You can communicate with people by tapping their hand. Jed-Jed Why did I decide to read this book? Jed-Jed (The homeless man) interested me because he was given Homeless (the puppy) and told to look for the mother's family, right before she died. He persisted, although he didn't have a home, and eventually found them and went out of his way to get Homeless to his rightful owners. the one girl who doesn't have a mom, she got kicked by her best friend she can see the ghost of her mom?????????? and dad can't see. will she persuade the dad?? and it shows one girl name cally fisher, and one gray dog's friendship. THE TEARS. This book made me ugly cry. I read this book with my 9-year-old son in an effort to expand his reading repertoire (currently his choices are based on how many illustrations are on each page). It kept his attention! He's not used to reading a book on deep issues like losing a parent, homelessness, and children with disabilities. I'm so glad we had this experience together. By its own measurements, this book is just about perfect. It is the 2013 Schneider Family Book Award Middle School winner. This little-known award from the ALA "honors an author or illustrator for a book that embodies an artistic expression of the disability experience for child and adolescent audiences." I had such a feeling of dread that Wonder, by P. J. Palacio, was going to win this award and possibly a Newbery Honor this year. I didn't review that book on Goodreads, because I knew I'd be pi By its own measurements, this book is just about perfect. It is the 2013 Schneider Family Book Award Middle School winner. This little-known award from the ALA "honors an author or illustrator for a book that embodies an artistic expression of the disability experience for child and adolescent audiences." I had such a feeling of dread that Wonder, by P. J. Palacio, was going to win this award and possibly a Newbery Honor this year. I didn't review that book on Goodreads, because I knew I'd be pilloried by the legions of readers who seem to adore it. Before I read I Wonder, I knew I was in for it when a) I saw the cover of the book (like A Clockwork Orange (? )), b) the New York Times Book Review critic said she "sobbed" when she read it, and c) one of our young library patrons asked for a read-alike, and when I suggested strong titles about disability communities, she informed me that what she really wanted was, well, books about deformed kids. Great, I thought. It's A Child Called It for the fourth grade set. Young Cally Fisher hasn't spoken in 31 days. It started as a contest, but then she realized that her recently widowed father and the teachers and students at her school weren't really listening to her (or, better yet, hearing her) and she felt a sense of relief by not oralizing, so she stopped talking. Cally is angry and sad about moving out of the home that contains her mother's essence in every corner, but when she moves into a strange apartment, she quickly becomes close friends with the boy downstairs. Sam is blind and becoming deaf. His life with his mother, who is supportive and funny, is representative of genuine disability experience. Cally learns to finger-spell into Sam's hand and she learns about braille. They're two kids hanging out together, who naturally adjust to each other's needs. Then there's the dog. It's a huge Irish wolfhound. He turns out okay too. And if there's a marvelous stroke of serendipity, that isn't completely unrealistic either. I thank the author for this book. And for not claiming fake credits in the back of the book. "I met a mute and blind kid at the dentist's office once!" That stuff is just insulting, folks. And it wouldn't fly with other minority communities. I personally loved this book. Wonderfully written and very emotional. It is about a girl named Cally Fisher whose mother passed away and she can see the ghost of her. And the only other creature that that can see her mother is a grey Irish greyhound that appears whenever the ghost of her mother appears. I highly recommend this book. Gr 4-7-Cally Fisher hasn't spoken for 31 days. As she explains in the prologue, "Talking doesn't always make things happen, however much you want it to." She knows that talking won't bring her mother back to life or keep her dad from selling their home in exchange for a small apartment so what's the point in saying anything. But when her mother appears one day wearing a bright red raincoat and the only other soul that sees her is a big scraggly dog, the girl knows she must find a way to convince her father that the dog is the only thing connecting them to her mother. But her father's growing depression continues to separate the family and Cally struggles to keep her mother from becoming a distant memory. When she meets Sam, who lives downstairs, the friendship that forms between the blind boy and silent girl manages to reunite a family, and each character benefits from the bond. Truly a lesson in the power of love and loss, this story shows that learning how to listen is more important than what's being said. This is a thought-provoking story that will speak to readers of all ages.-Cheryl Ashton, Amherst Public Library, OH (c) Copyright 2012. Library Journals LLC, a wholly owned subsidiary of Media Source, Inc. No redistribution permitted. Really good - sad, lighthearted, realistic. Cried through much of it. Good resolution at the end. Beautifully written, heartwarming, emotional rollercoaster of a story about Callie who decides to stop speaking until she can convince her father and brother to talk about their dead mother. The family is still grieving over the accident that killed Callie’s mom a year ago. The father and brother are trying to deal in their own way – which involves not talking about her and “moving forward.” Callie k Really good - sad, lighthearted, realistic. Cried through much of it. Good resolution at the end. Beautifully written, heartwarming, emotional rollercoaster of a story about Callie who decides to stop speaking until she can convince her father and brother to talk about their dead mother. The family is still grieving over the accident that killed Callie’s mom a year ago. The father and brother are trying to deal in their own way – which involves not talking about her and “moving forward.” Callie keeps seeing her dead mother but no one is listening to her. Convinced that the homeless wolfhound is her last connection to her mother, Callie tries to tell her father about it to no avail. The family has to sell their house and move to an apartment. There, Callie meets a blind and deaf boy named Sam. Sam believes her story about the dog and her mother. Together they unravel the mystery and in the process become best friends. These characters are well developed and realistic. They have emotions, problems, and dreams. Callie transforms from being needy and annoying into a strong, decisive person who teaches those around her some life lessons they will always remember. The writing is straightforward and it is a quick, but emotional read. Sarah Lean has written a sensitive story about a young girl who desperately wants to mourn the untimely passing of her mother but who can't because her father always silences her questions and memories. So when a school-wide contest to see who can be quiet for an entire day in order to donate to a worthy cause happens, Cally gets the bright idea to continue her self-imposed silence for days that run into weeks. She is sure she sees her mother around town, but of course, her dad doesn't believe h Sarah Lean has written a sensitive story about a young girl who desperately wants to mourn the untimely passing of her mother but who can't because her father always silences her questions and memories. So when a school-wide contest to see who can be quiet for an entire day in order to donate to a worthy cause happens, Cally gets the bright idea to continue her self-imposed silence for days that run into weeks. She is sure she sees her mother around town, but of course, her dad doesn't believe her. Her new neighbor, Sam, himself a special young boy (read the book to find out how...) does and together they try to figure out the significance between the sightings, a homeless man and his dog. Could Cally's mom want to give her one last thing? A Dog Called Homeless is a perfect read aloud and will surely help develop empathy among our students. Highly recommended! I wasn't expecting a lot from this book, but it surprised me by being sad and sweet and beautifully written. It pulls out all of the stops in terms of being heart-jerking: a dead mother, a withdrawn father, a young girl who refuses to speak, having to move house, a deaf/blind boy, a homeless man, a lost dog. But despite all of these elements, it manages to be honestly affecting. The mystery of the dog, "homeless," is resolved in a particularly satisfying way. This review has been hidden because it contains spoilers. To view it, click here. Those who enjoyed Patricia Reilly Giff's Pictures of Hollis Woods will enjoy this. There was so much sadness in this story in which a series of unrelated events all happen for a very good reason. The sad - a dead mother, a character who chooses not to talk, a boy who is deaf and blind. The happy - there's a dog in it and a loving if distant father. PS. Stick with this one, the ending is fabulous! If I weren't sitting at my desk right now, trying to pretend to be a normal person, I would be bawling my eyes out. That's not to say that some tears didn't escape, anyway. This book was so, so beautiful, graced with quiet, gentleness, and love. I feel as though my heart was wrung out until it was empty and then filled to overflowing. This is one of those books that I wish everyone in the world could read. It's that special. I don't know how else to convey how it makes me feel. This book has been the sleeper hit of my Advance Readers Club of 5th and 6th graders. It deals with some difficult themes, death of a parent, depression, a child going mute, a neighbor child who is blind and deaf--however, this story is surprisingly uplifting. And an added bonus--the dog does NOT die. My students & I were riveted and very involved in this story. I can only say I teared up a couple of times while reading this aloud and no one said a word. They were totally committed to these characters and their story. I heartily recommend this story to adults and students alike. You won't regret it. You will savor it. Another great story about a young girl with a troubled heart. What a dear sweet story! A quick read with short chapters that gather you in. Lovely characters. A young girl who has lost her mother to a car accident stops talking. This is her story and that of her family and friends and an Irish Wolfhound named Homeless. I was really touched. It had me in tears. More like 4.5 stars!!! What a powerful and moving little read about a girl searching for her voice and so much more. I really enjoyed reading this book, it was an emotional ride, the perfect fit for dog lovers and people lovers. Full Review to come closer to the Pub Date. For a long while, I really didn't like the book, but because it was a slim little story, I stuck with it. I did like the way the author tied it all together in a loving way. There is a British lilt to her writing, some of her turns of phrase are a little strange. But I liked that too.